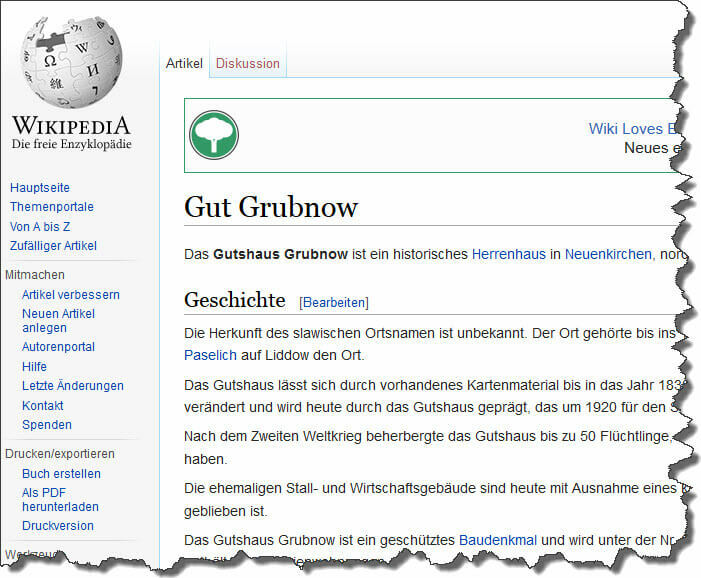 The historical Gutshaus Grubnow could be traced back to 1836. The original buildings were altered significantly during the centuries. Today, the "Gutsanlage" is embossed by the Gutshaus Grubnow that was build around 1920 for the son of Knighthood Erich Kroos who previously lived at neighbouring Gut Lebbin. – - – . The Gutshaus and the building "Remise" are the only two remaining buildings from this formerly extended property. Gutshaus Grubnow is listed in the memorial-archive of Ruegen under number 338. The Gutshaus Grubnow is under a preservation order and was renovated in 2005 according to historical plans. Sources: “Schlösser und Herrenhäuser auf Rügen”, Helms, T. und Bock, S., Edition Temmen; as well as documents from former residents. Further infomation of Gutshauses in Wikipedia.